Here are 10 free websites with printable counting worksheets for kindergarten that can help children learn to count. Counting is the basic fundamental of Math and kids love to play with numbers. With the help of these counting worksheets, kids can easily learn to count. 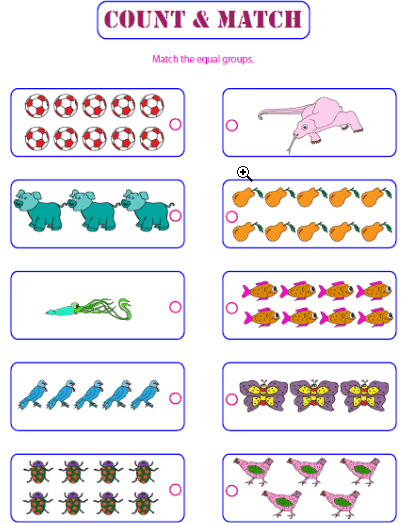 These sites have a good collection of counting worksheets based on different categories. These include tracing numbers, count the objects, count and match, fill the missing numbers, etc. Math is itself an interesting subject but what if you can make this subject more playful by providing these worksheets to kids? Of course children will love the idea. Since you can take print of these counting worksheets, kids can learn through them at home, schools, etc. While some sites offer colored objects, other provide objects in black and white or grey-scale in the worksheets. EDUBUZZKIDS is a website that offers free counting worksheets for kindergarten. The site has a good variety in counting worksheets. With the help of these math worksheets, kids can practice counting with fun. As you can see in the above image, there are three types of counting worksheets in which the first one has different colored shapes. Here, children need to count the number of each shape and then write a correct answer in the circle given below in the worksheet. For example, there are two shapes of the circle with magenta and orange color. So the children can write number 2 below the shape of the circle. Another worksheet in the above image asks kids to count objects in the worksheet and then write the correct answer in between the objects. For example, there are eight boxes in the first picture. So here children can write number 8 in the circle located between the objects. In the third worksheet, there are some images along with two numbers. The answer is hidden in both of these numbers. Children have to count the images and then mark a circle around the correct number. For example, the first image is of three Ladybirds and two numbers (3,2) are given below the picture as an option. Here, children can mark number 3 as there are 3 ladybirds. Solving these activities and counting in this playful manner keeps children’s interest high. You can try these worksheets for kids to make their education interesting. 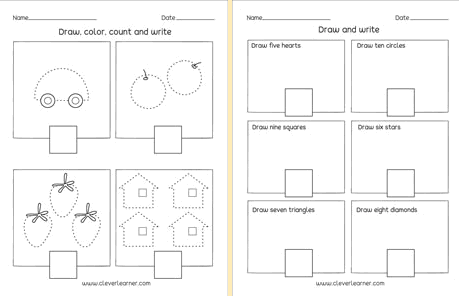 Cleverlearner is a good website that provides many counting worksheets for kindergarten. The name of the site reveals itself that learning from this site makes children clever. The site provides activities like picture counting, count and write. In the above image, the worksheet asks children to trace lines in order to complete the drawing. Thereafter, kids need to color the object and then they need to count the number of objects and write the correct number in the box given below. For example, the first picture is of a car, children can trace lines to draw, then color and write number 1 in the box because there is only 1 car in the picture. The second picture is of 2 oranges, children need to complete the drawing and then color both the items. Thereafter, they can write number 2 in the column. Another worksheet, you can see in the above picture which asks kids to draw and write. For example, in the first column, it is asked to draw five hearts and then they have to write the number 5 in the box given below in the worksheet. Practicing these counting worksheets can make children smarter as they can learn to count in a fun way. Teachers and parents can try these counting worksheets for kindergarten in order to teach kids to count. KindergartenWorksheets is the website which provides counting worksheets for kindergarten. The site has worksheets like tracing numbers, counting objects, etc. The above image of counting worksheets is fun and educational. The first worksheet has images of items in each column. Also, the sheet has three squares with numbers at the bottom of the worksheet. In this worksheet, children need to count the images and then trace the numbers in each square. Thereafter, kids can cut out the number images and paste in the box where they belong. For example, in the first column, there are 6 apples. So here children need to cut the image of number 6 after tracing it and then paste it in the box right next to 6 apples. In this way, counting can be fun for kids to learn. Another worksheet in the above image has missing counting numbers. In this worksheet, there are 20 images of apples. Here, kids can trace the number 1 and then follow the series in order to complete counting from 1-20. Such counting worksheets can help children to learn counting in an easy way. Math Worksheets 4 Kids is an interesting website that helps kids in learning numbers in different ways. The site has counting worksheets for kindergarten which you can print out individually or you can download the entire set of worksheets. Learning counting can be fun for kids if you let them try these playing worksheets. You can see in the above image, the sheet asks kids to count images and then match to the set that has same number of items. For example, the first group in the worksheet is the group of 8 footballs. Now, children need to match the group which has 8 items, for example, the group of 8 pears. Hence, children need to match the group of 8 footballs to the group of 8 pears. It will boost up the mind of the kids as it will make them count objects and then match to the other group of objects. There are other playful counting worksheets available on the same website. Trying these counting worksheets can help children to learn counting in an easy way. Education.com is one of the most famous websites that offers counting worksheets for kindergarten. When it comes to learning counting, kids might not take much interest in it. But learning counting playfully can be more interesting as children love to play. As you can see in the above image, all 4 worksheets have only counting practice but you can see all of them are being presented in different ways. For example, in the first worksheet, you can see there are creatures in colored pictures along with two-digit counting. Here, children have to count creatures and match them to the correct numbers. In the second worksheet, you need to count as well. The worksheet asks to fill the missing numbers in order to complete the counting series from 1-30. Counting can be fun when it comes to learn counting in this playful manner. Children will surely like these worksheets. Parents and teachers can take out prints of these worksheets for children. K5 Learning is a good website that offers counting worksheets for kindergarten. The site has various kind of counting worksheets that can help kids to recognize, read and write numbers from 1-20 in a playful manner. The above screenshot is the proof of how playful and colorful counting worksheets the site has. Here, in the first worksheet, children need to count these objects and write the number in the blank space. If there are three hearts so the children have to write number 3 in the blank space. Similarly, in the second worksheet, it is asked to circle 4 hearts from 10. Here, children can circle the last row of 4 hearts. In the next question, children need to circle 6 stars from 10. In this way, children can learn numbers and counting as the site has enough interesting counting worksheets. 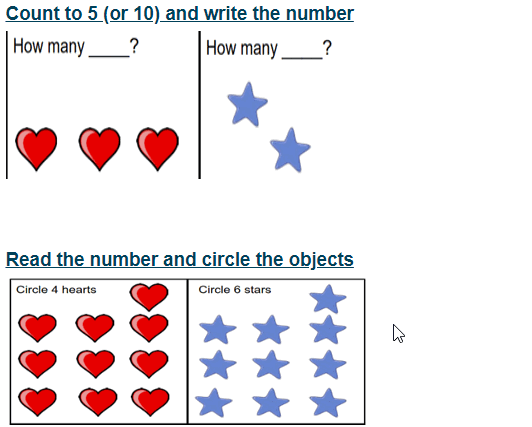 JUMPSTART is a good website from where you can get free counting worksheets for kindergarten. The site offers categories like counting, tracing numbers, count the objects, etc. This site can help children learning counting in a fun way. You can see in the above image, the farmer is offering a Thanksgiving dinner at home and for this, he has to count fruits from his farm so that he can prepare food. Here, children need to help the farmer count these fruits. Thereafter, children can write the correct number right after every fruits name mentioned in the worksheet. For example, in this image, there are 4 apples so children need to write 4 in the column of apple. Similarly, children have to solve this worksheet in order to help farmer in counting these fruits. You can find similar counting worksheets for kindergarten on JUMPSTART to learn numbers in an easy, fun and educational way. 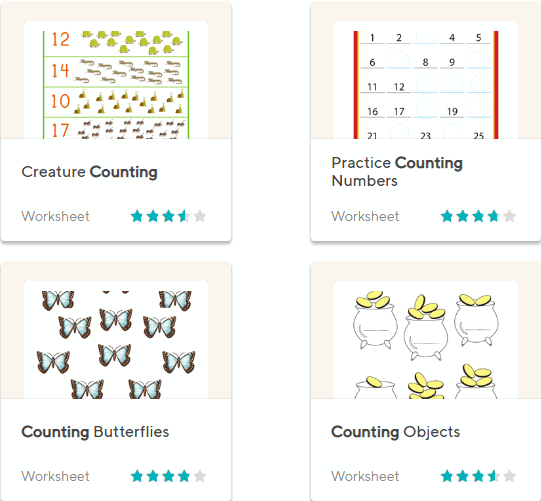 The website (my Teaching Station) is a good website that offers counting worksheets for kindergarten. With the help of these counting worksheets, children can learn counting in fun and an easy way. The first worksheet in the above image asks kids to practice skip counting which means, children need to read this counting chart by skipping 2 numbers. In this way, kids can learn to count smartly. It will also help children to fill missing numbers in the worksheets. Another worksheet in the above picture asks children to trace numbers from 0-29. This can be helpful for children to learn and write numbers. Similarly, other worksheets offer counting in various way. Children can learn a lot from these counting worksheets. So, let the kids try these worksheets. MATH-SALAMANDERS.COM is an interesting website as it offers many counting worksheets for kindergarten. The site has enough playful counting worksheets that children can try at home and school. 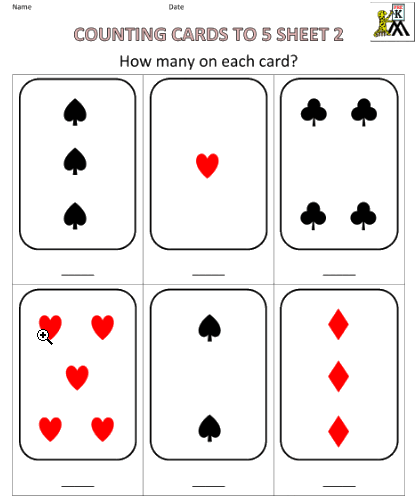 In the above image, the worksheet has counting cards. Here, children have to count and write the number on the line provided below each card. There are other counting worksheets that ask children to trace the numbers and match the objects. This way, kids can learn to count in a playful manner. Try these worksheets and take out prints of any worksheet that you like and provide it to children. HomeSchoolmath.net is a website that has counting worksheets for kindergarten. 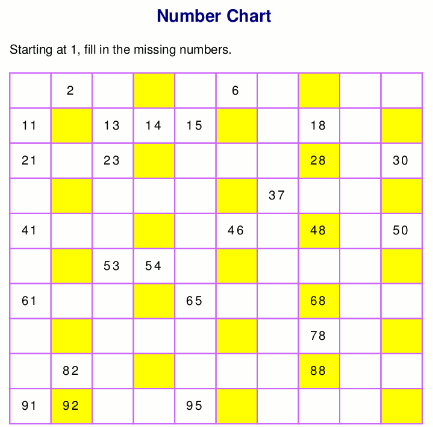 The site basically offers number charts, counting, skip counting worksheets. 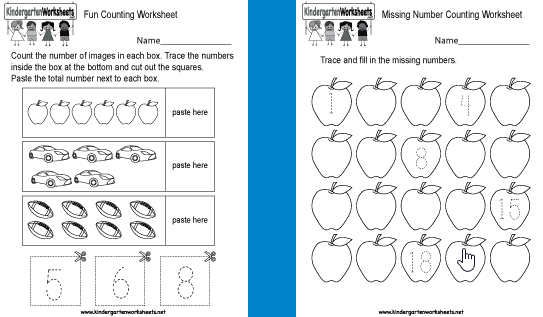 Children can read the number charts to learn to count or practice these counting worksheets. In the above image, you can see skip counting worksheet. This worksheet asks kids to fill the missing numbers in order to complete the counting chart. In this sheet, you will find every fourth box highlighted with yellow color. Children need to write counting from 1-100 in this worksheet. This is a fun way to play with these kinds of worksheets in order to learn to count. Also, you can read this article to get printable worksheets for other subjects. Kids are always curious to learn new things. Now whether kids learn numbers on their fingers or through any activity depends on them. But with these free websites you can provide counting worksheets for kindergarten kids and they can learn to count in a playful manner. Which is definitely the best way to learn. You can also take out prints of these colorful counting worksheets so that children can practice on them. Try them out and let the children play with these educational websites.